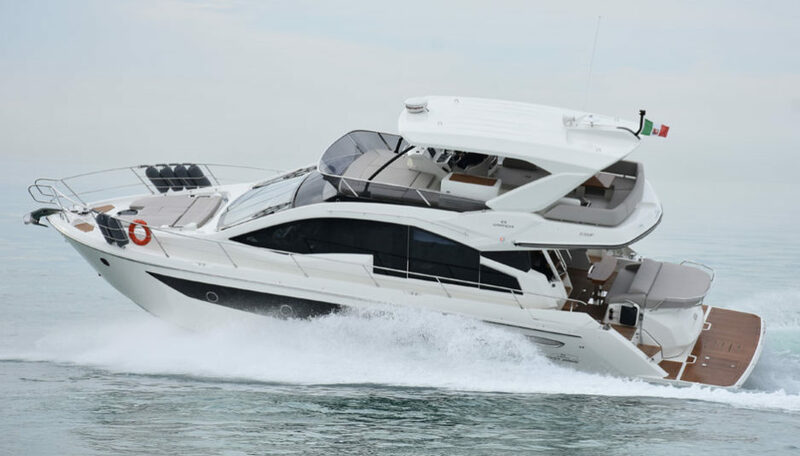 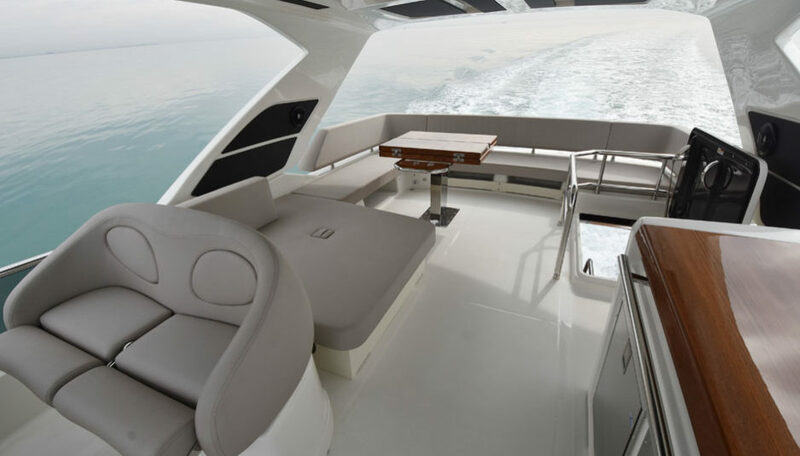 What’s more traditional than a 17-meter flybridge yacht? 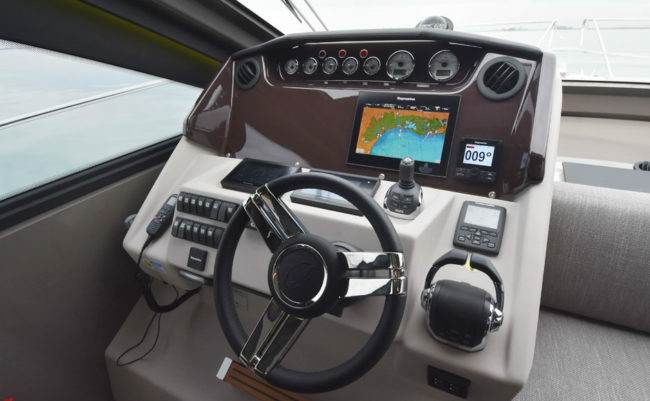 And…how can you make it more innovative? 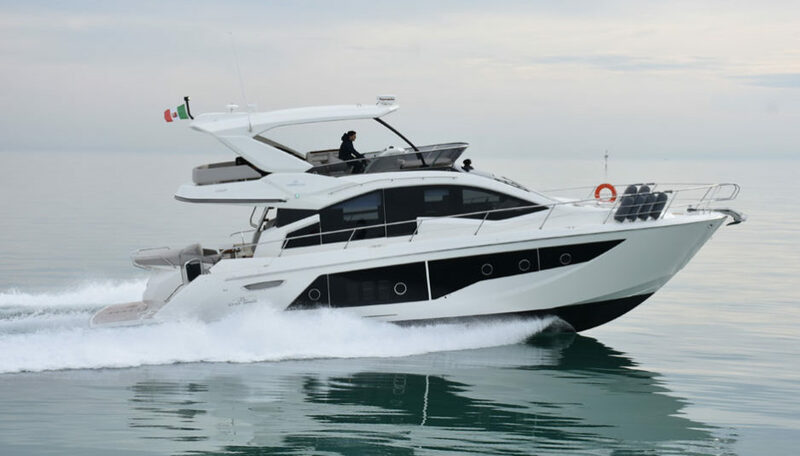 Here’s how Cranchi E56 F Evoluzione achieved it. 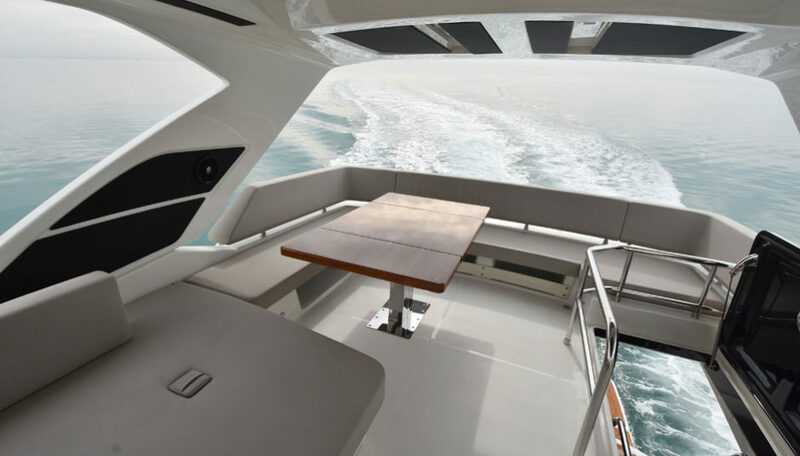 In the wake of tradition, but introducing a series of evolutions that maximize the pros of a flybridge. 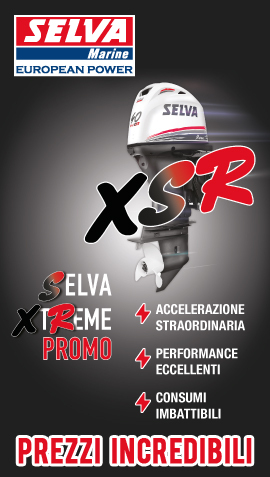 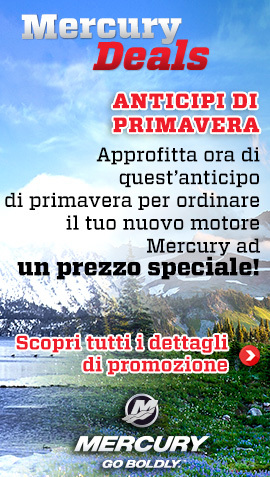 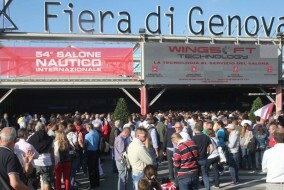 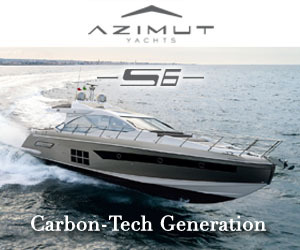 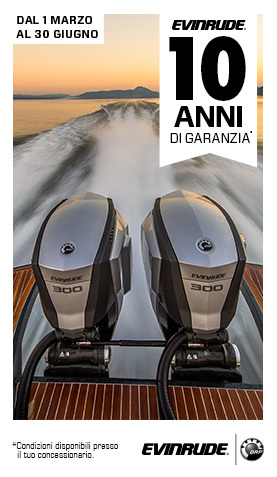 In a sentence, this is the first sensation after boarding the Cranchi E56 F Evoluzione. 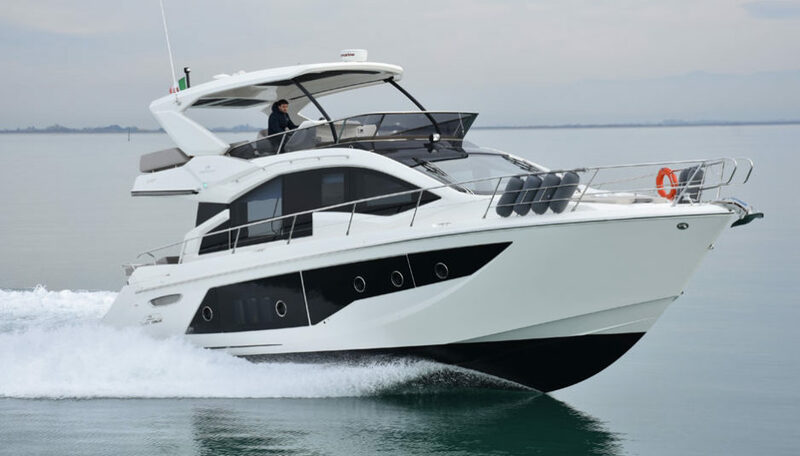 We are in Udine, northeastern Italy, at Cranchi headquarters, and I am going to sea trial it. 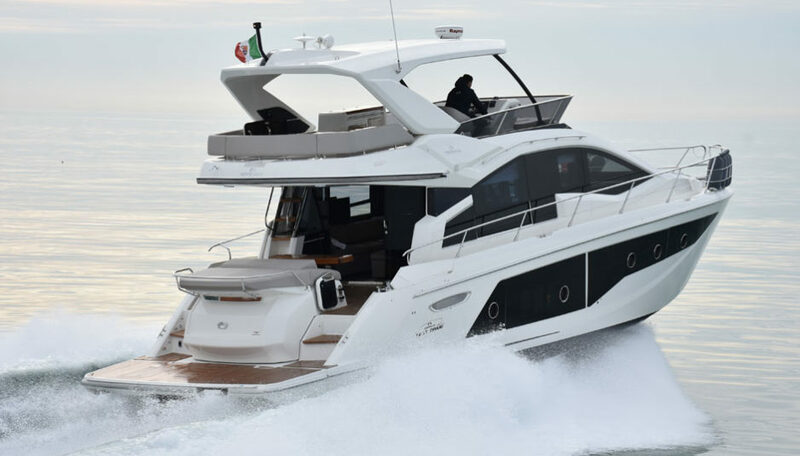 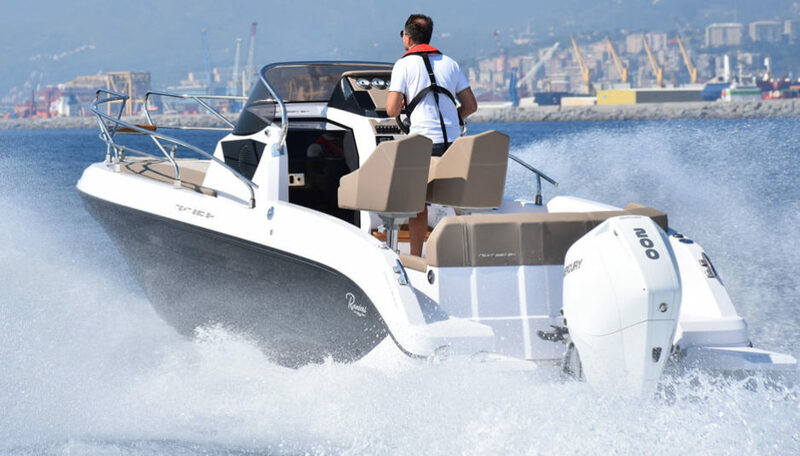 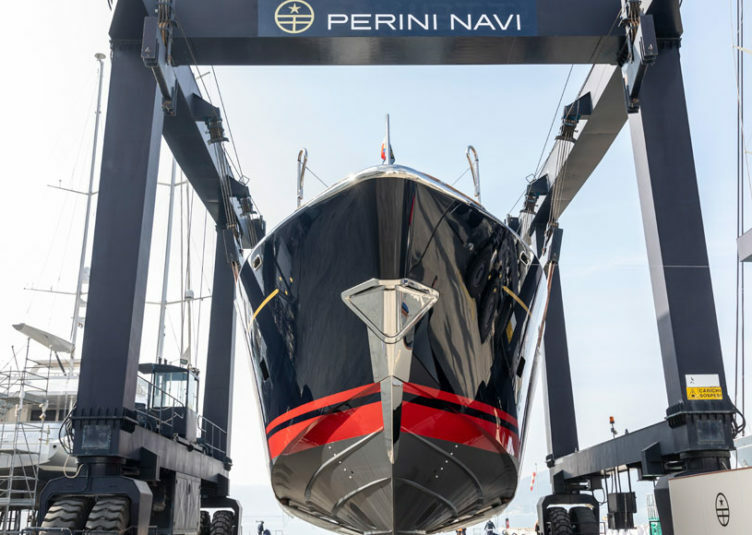 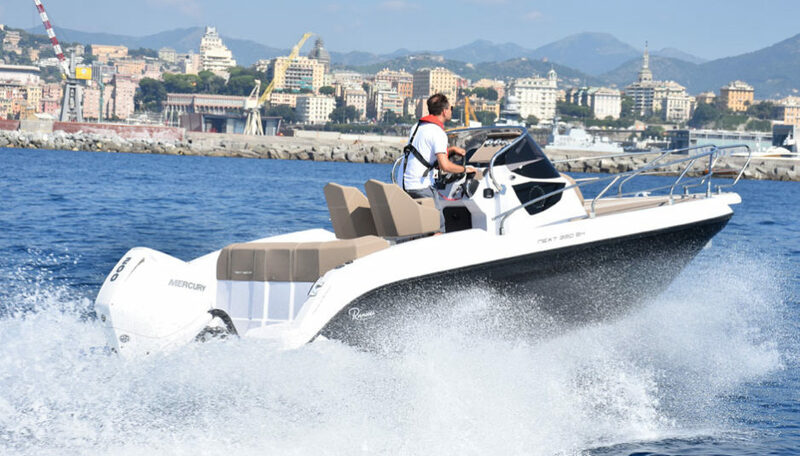 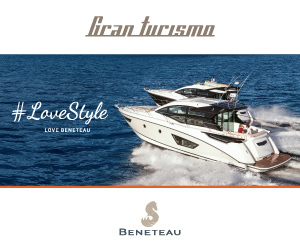 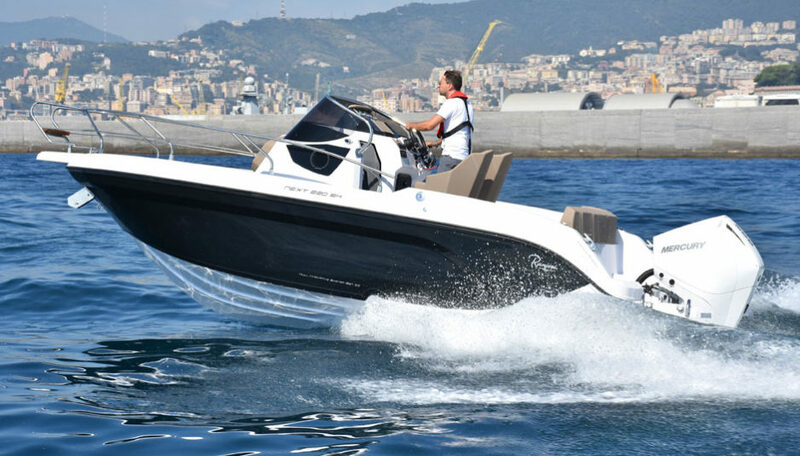 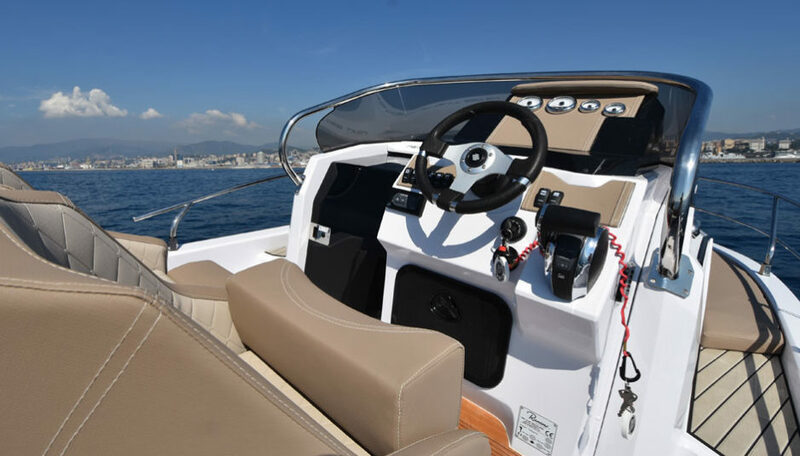 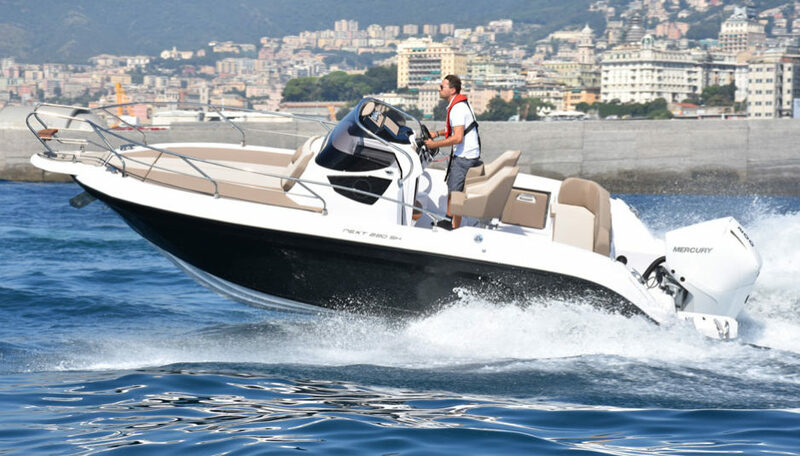 The two Volvo IPS950 transmissions, coupled to twin 725 hp D11 turbodiesel engines, provide an important reserve of power for the Cranchi E56 F Evoluzione, but also grant a high level of comfort during navigation. 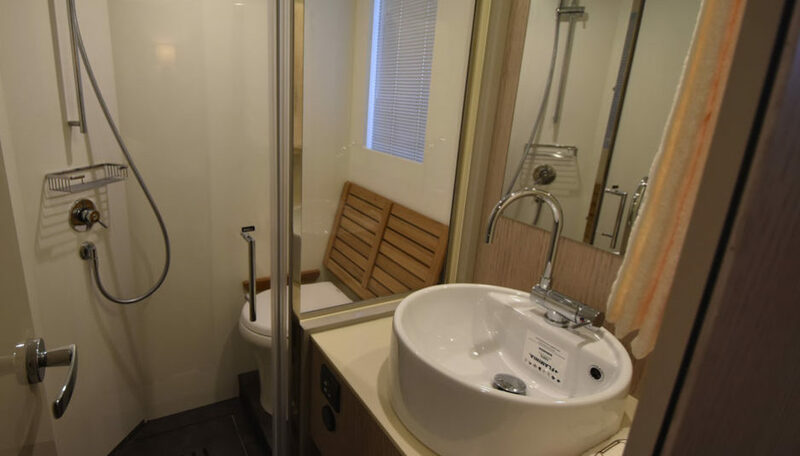 The phonometric data were measured in the salon, with closed doors, and are as excellent as the ones reckoned in the cabins. 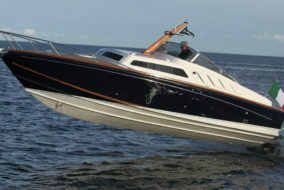 At cruising speed (25 knots) the readings say 69 db in the bow and 74 db in the mid one, which is closer to the engines. 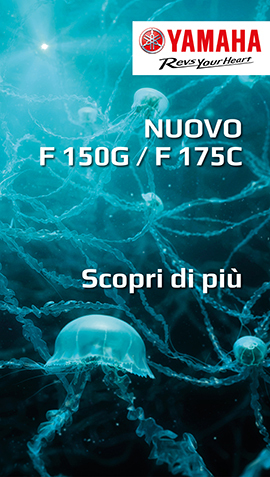 I started with these numbers because the level of quietness is the first, positive sensation as we start the test. 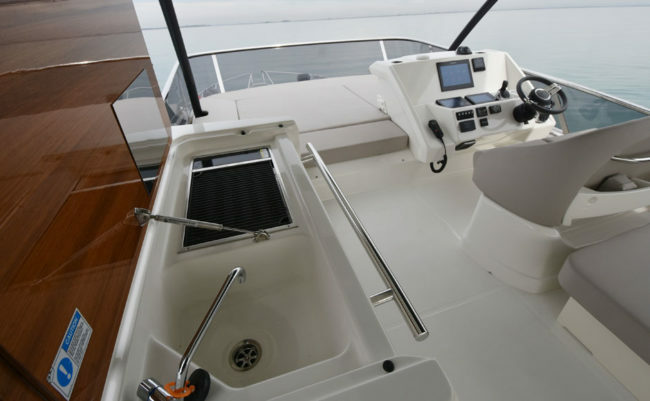 As for the marine capability, this is a well-known hull, and unfortunately our calm sea does not stress it at all. 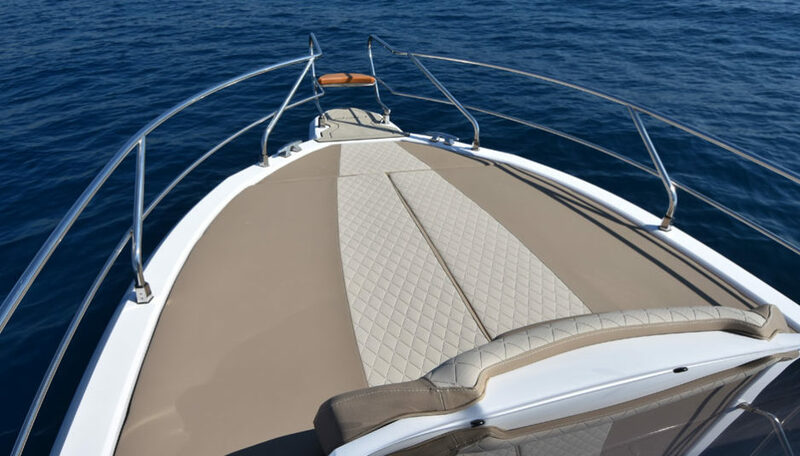 Still, crossing our wake causes no sharp impacts at all and confirms that even on chopped sea the behavior would be smooth. 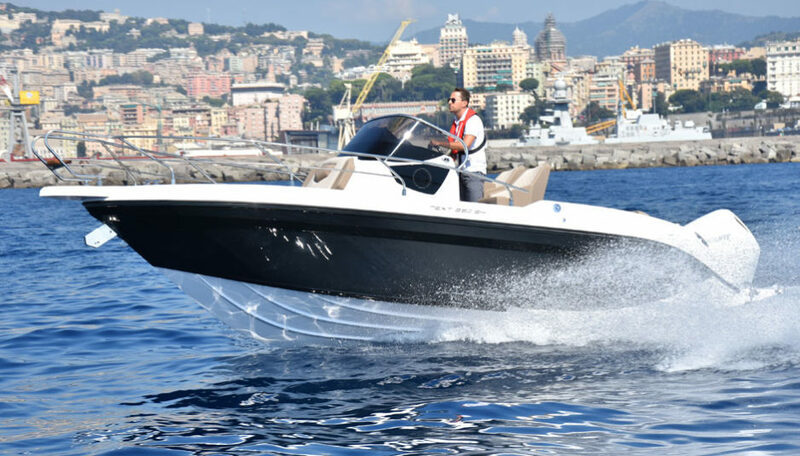 Fuel consumption is average, while the 36-knot top speed is aligned with the Cranchi E56 F Evoluzione segment: but I am more interested in cruising speed. 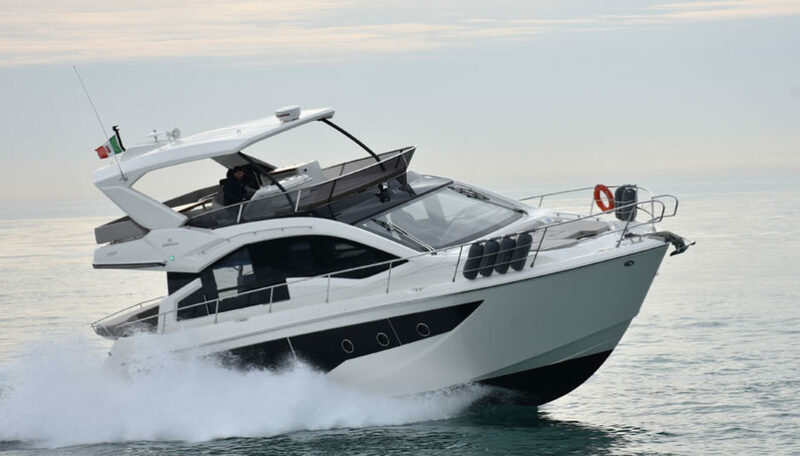 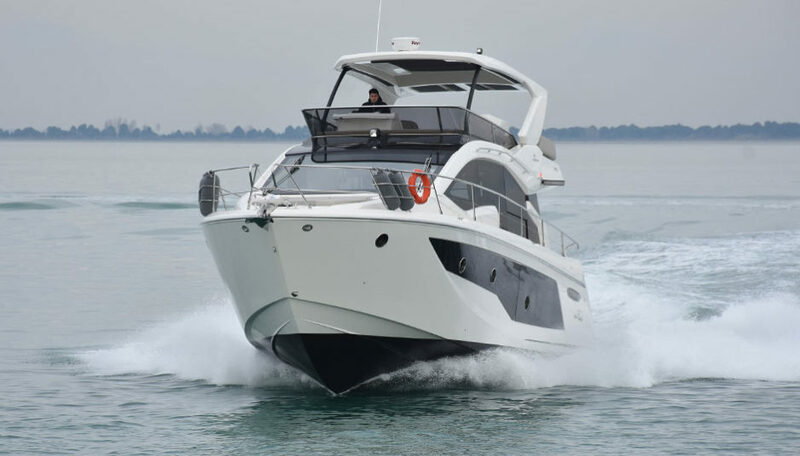 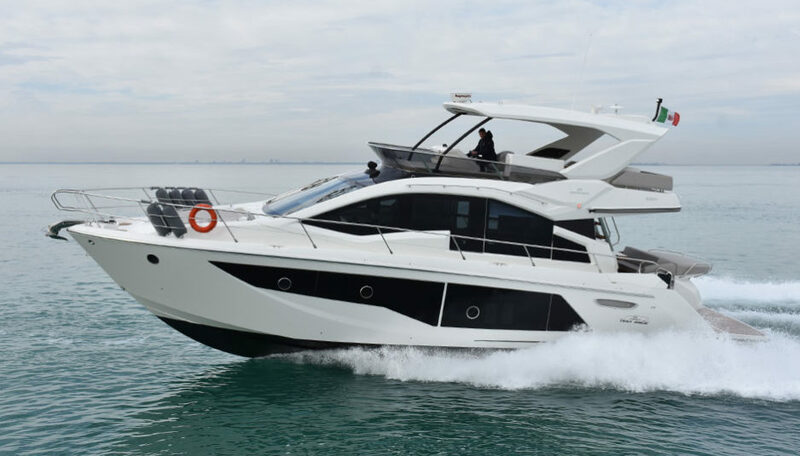 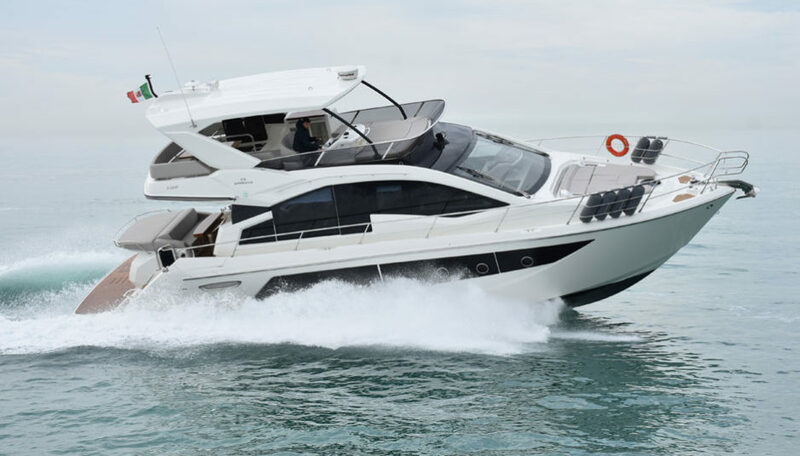 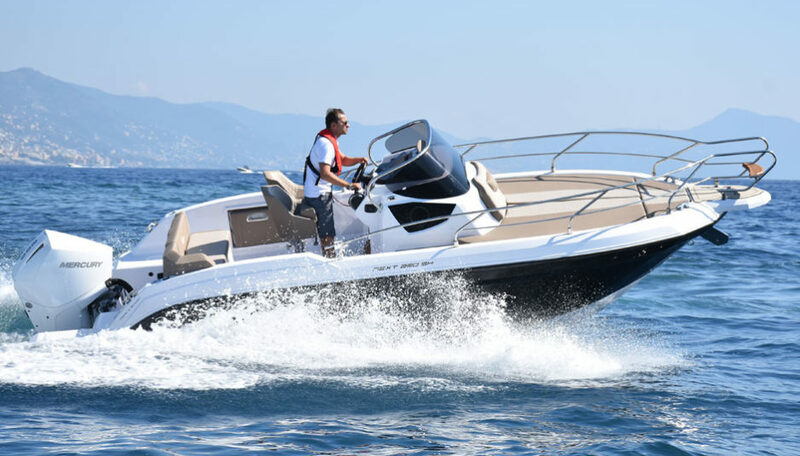 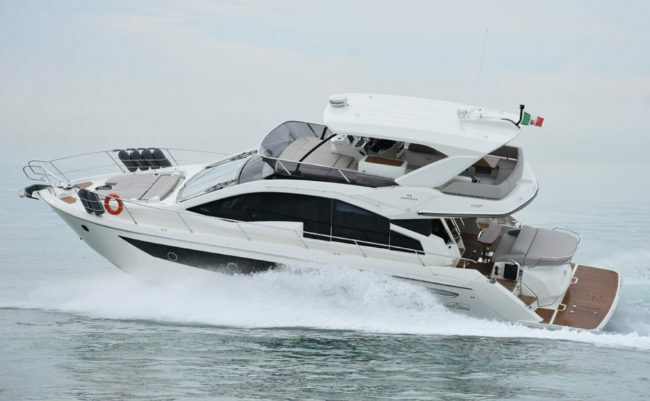 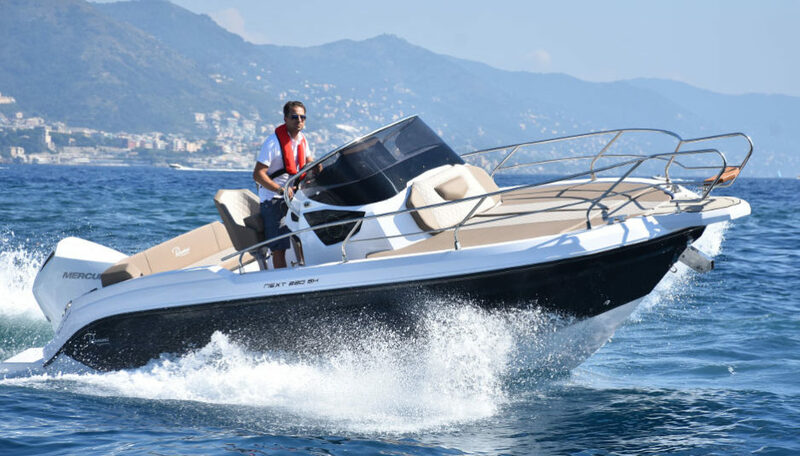 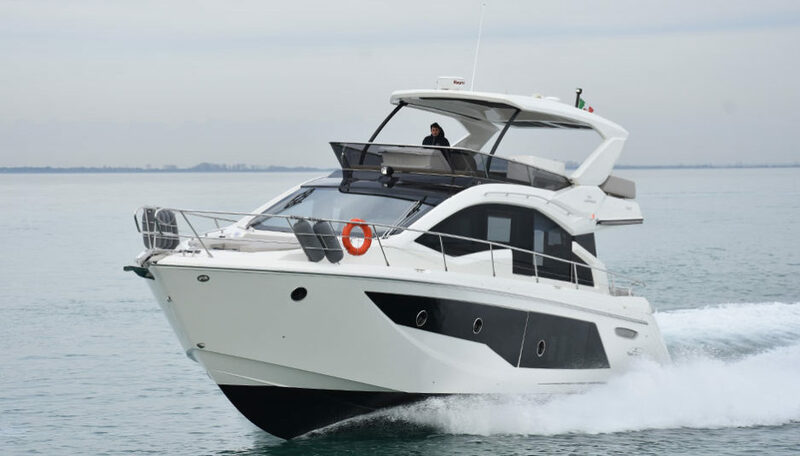 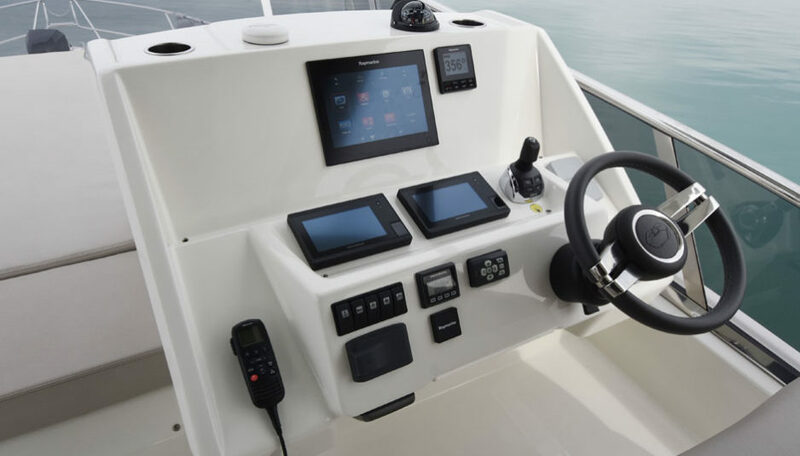 As we mentioned it can be reckoned in around 25 knots, a pace that guarantees a consistent reduction in consumption, but also a great navigation comfort. 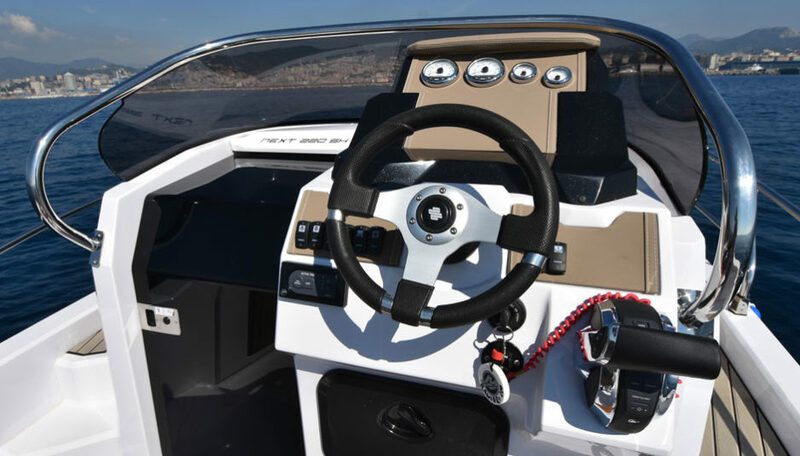 If you need to sip fuel though, the minimum plane pace is kept at 1480 rpm and 12.5 knots, with the engines burning 107 liters of diesel per hour, in total. 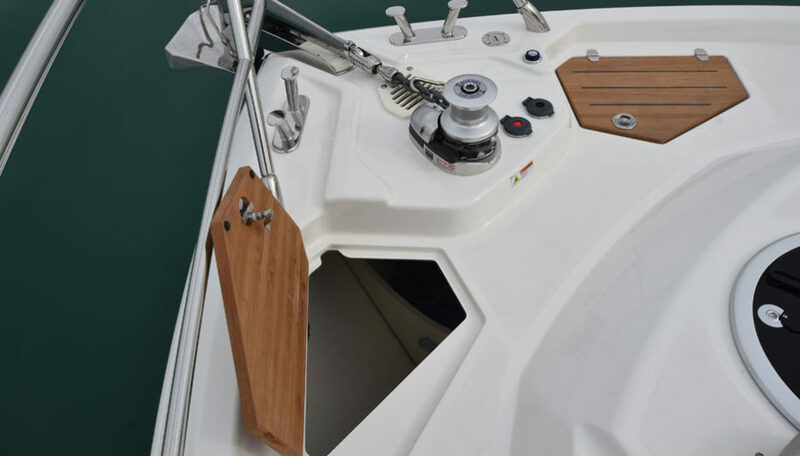 All these measurements were carried out with the Humphree interceptors working. 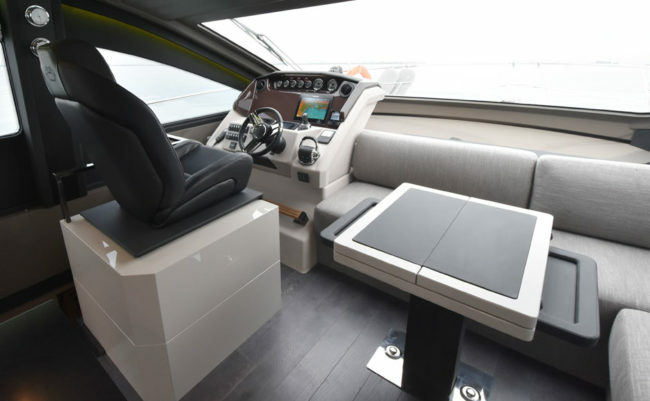 I am not toatlly convinced by the driver’s seat, which is very comfortable but a bit too tall. 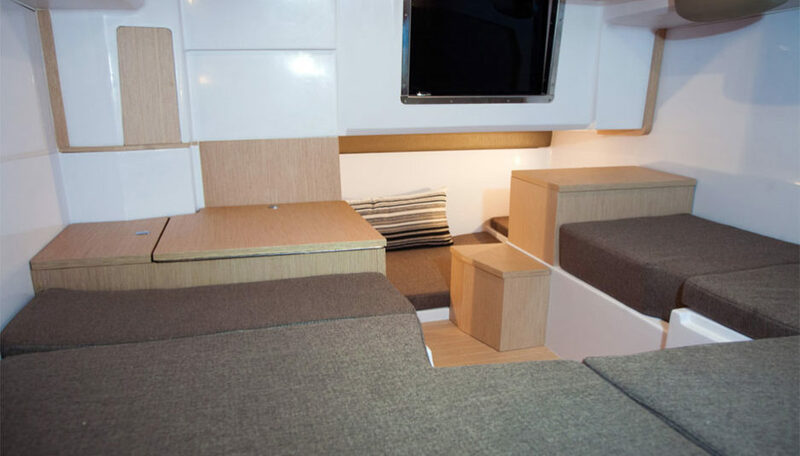 More, the side visibility is hindered by the massive pillars. 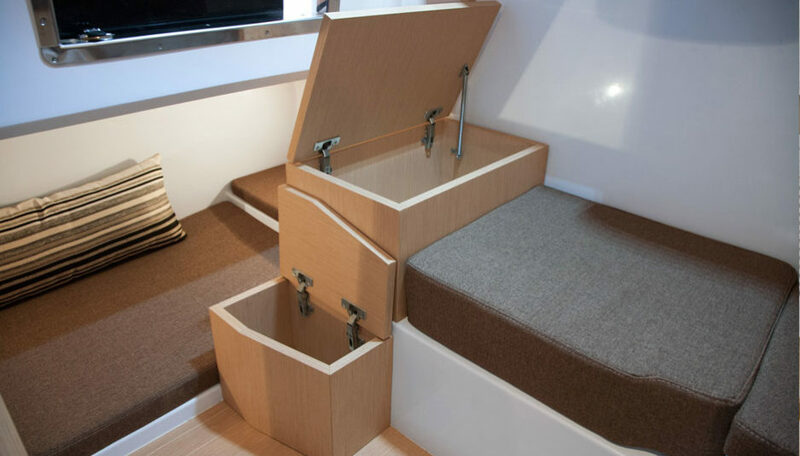 Considering that I am not a basket player, I reckon that taller drivers may find themselves even more uncomfortable. 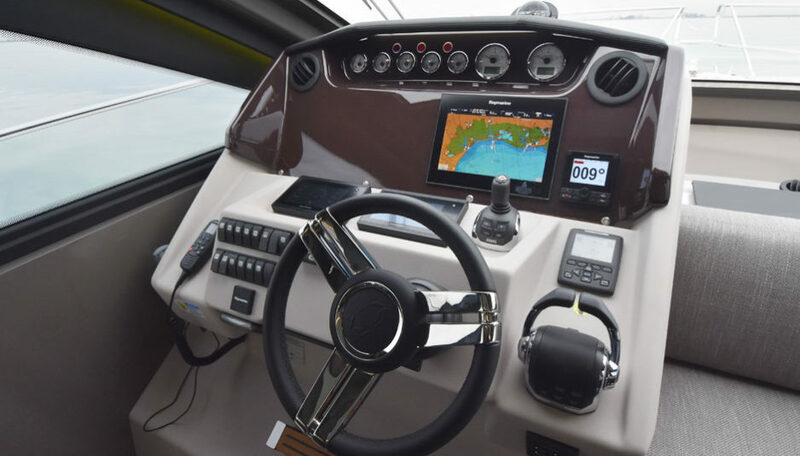 On the other hand, the dashboard is good to look at and full of information, thanks to the large Raymarine monitors that make (almost) forget the analog instruments in the upper part. 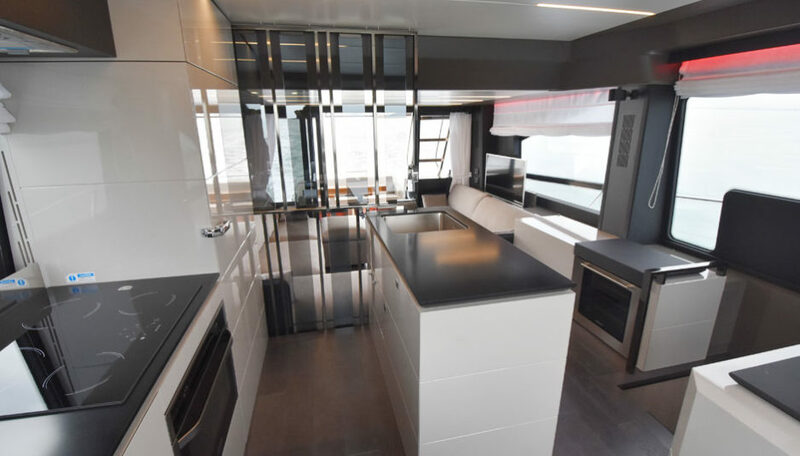 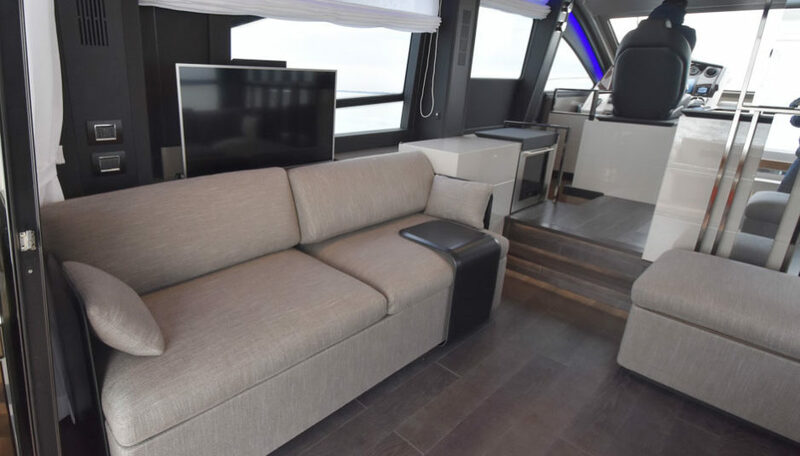 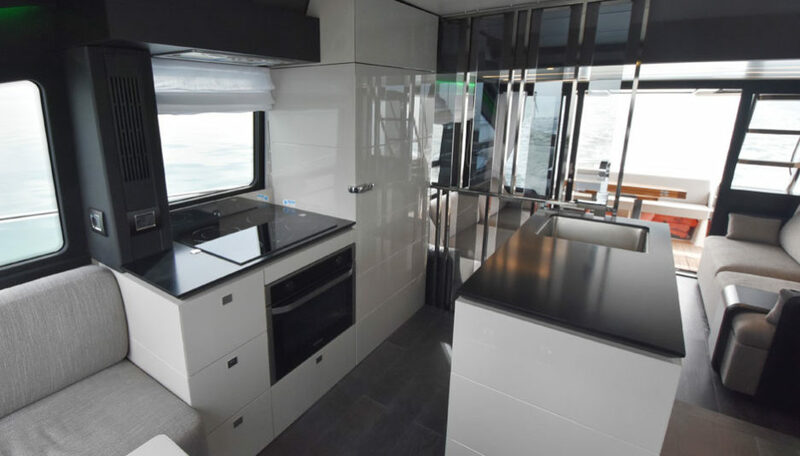 The main deck of the Cranchi E56 F Evoluzione is certainly the most peculiar area: the galley is located amidships, with the dinette abow, beside the helmstation. 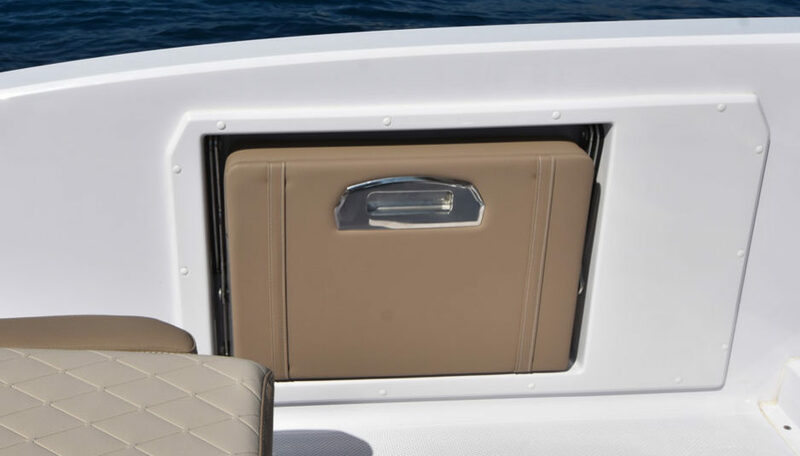 Considering the absence of a side passage, this solution must be accepted as it is. 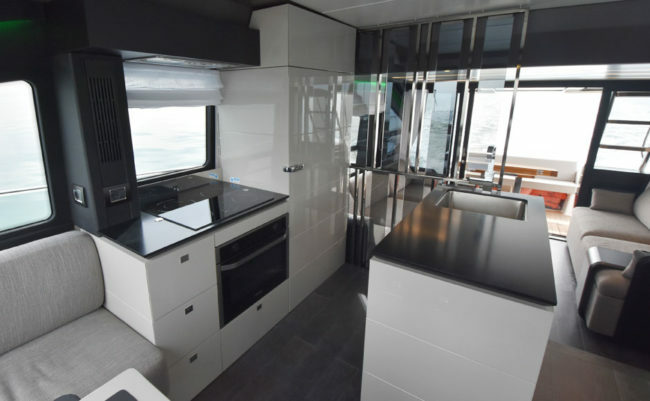 Nowadays we see more and more the galley moved to the back, closer to the outer cockpit, but not here. 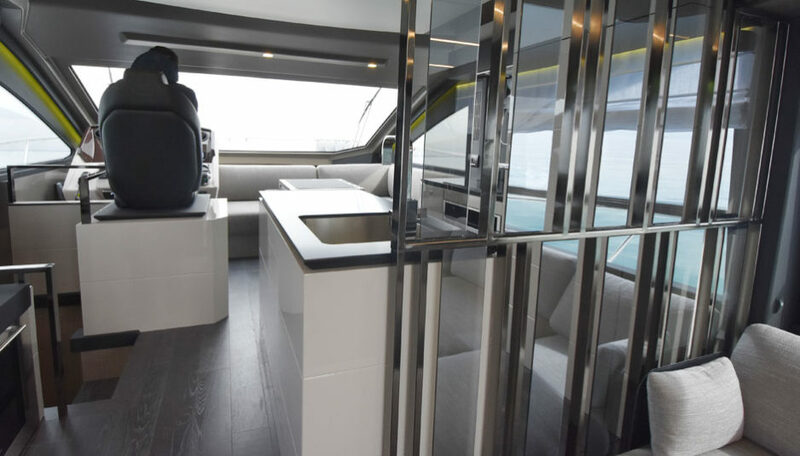 Anyway, the execution is excellent, with a further countertop to enlarge the working area of the galley. 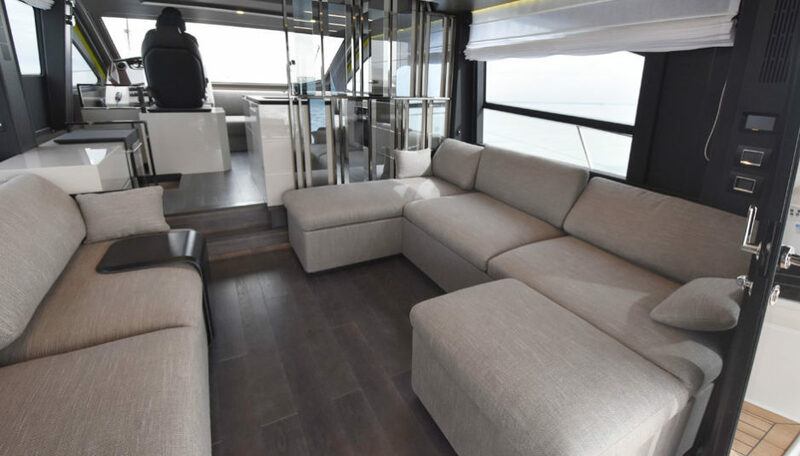 The back of the salon is dedicated to the relax area, with two side-mounted sofas, pop up TV, a small table that partially disappears, and the large glazing to give plenty of light. 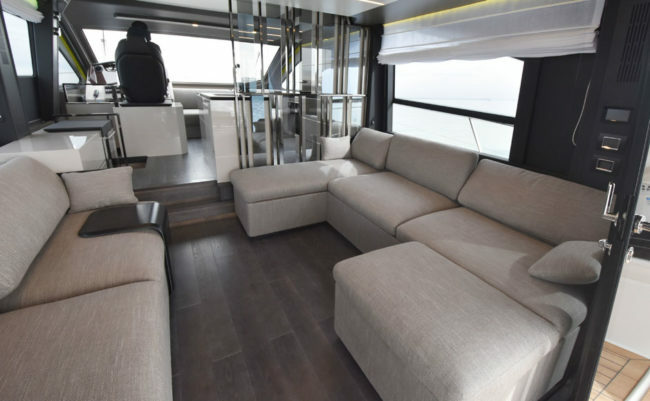 The structure that divides the room, made in steel and crystal, doesn’t seem to be properly “marine”, but does its job very well. 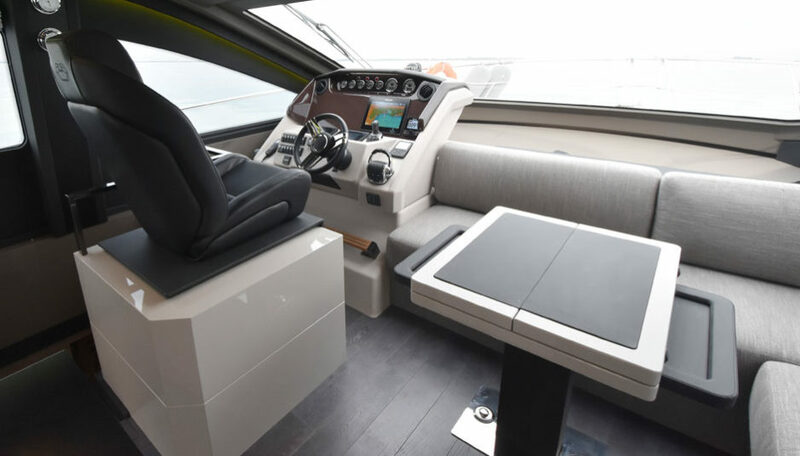 Instead, the colors dedicated to chromotherapy leave me indifferent, while I appreciate the wide three-part door that leads to the cockpit. 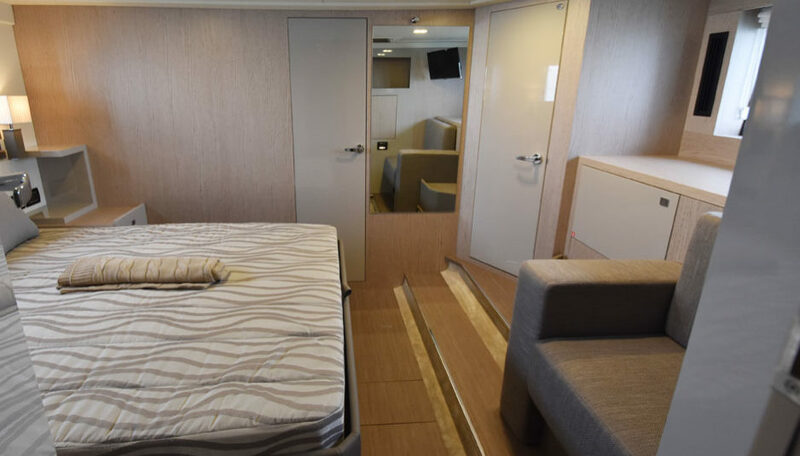 Back to bow, I step down into the lower deck: there’s three cabins featuring a conventional layout but a rational distribution of volumes. 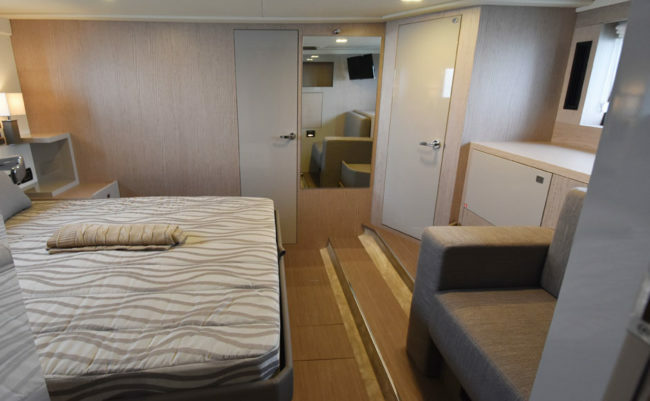 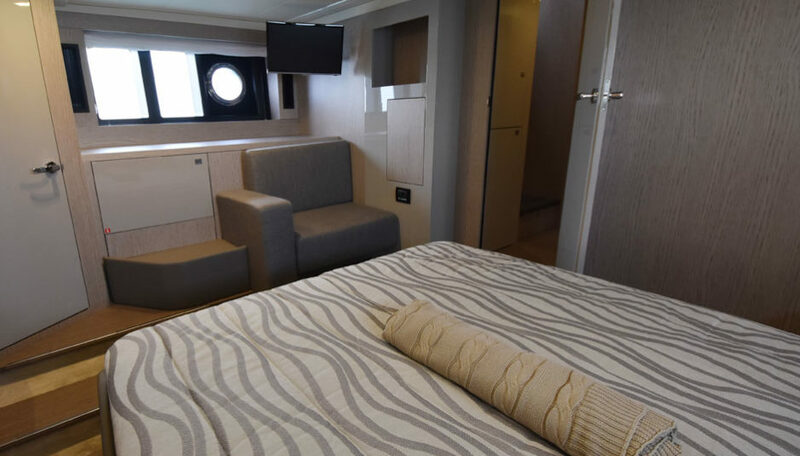 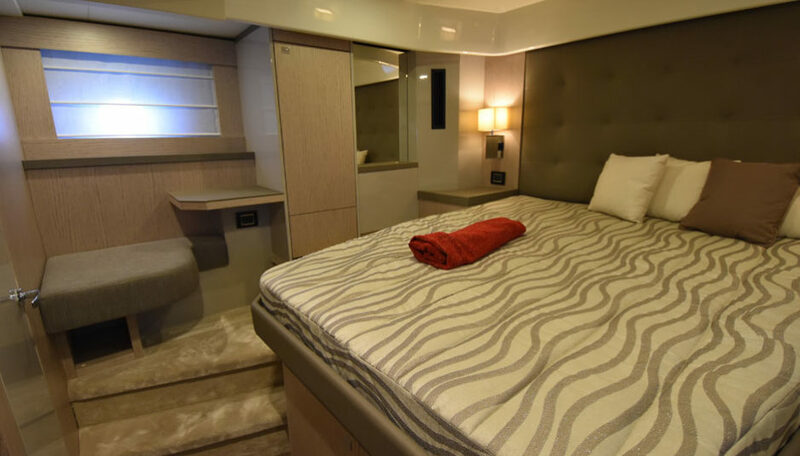 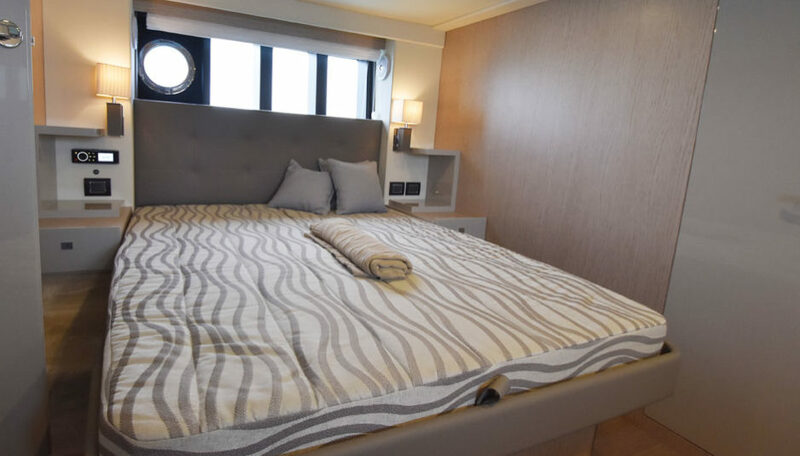 The master stateroom is amidships, with the bed leaning against the starboard side and the bathroom, shower compartment and walk-in closet to act as a separation from the engine room. 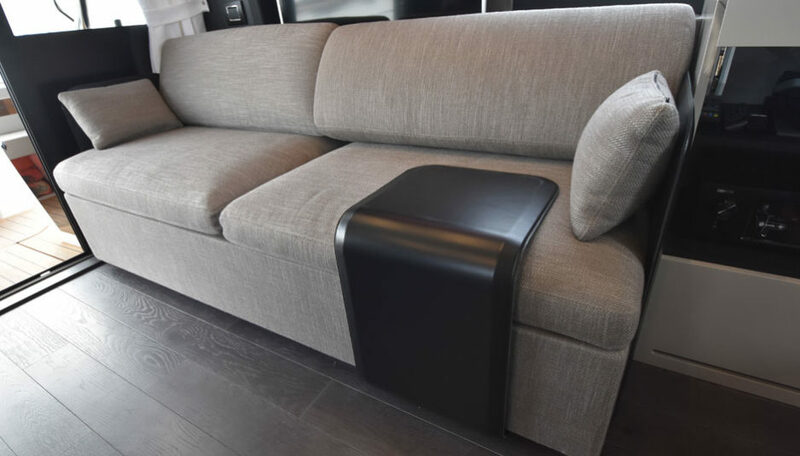 As mentioned, the result is excellent in terms of sound insulation. 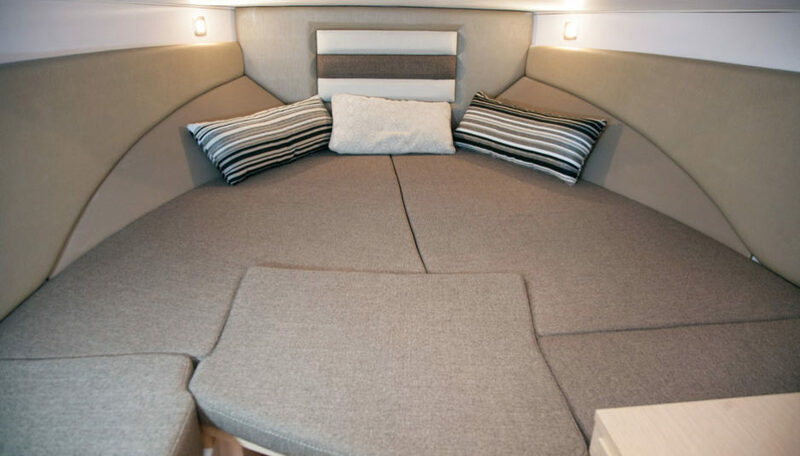 Chapeau to Cranchi. 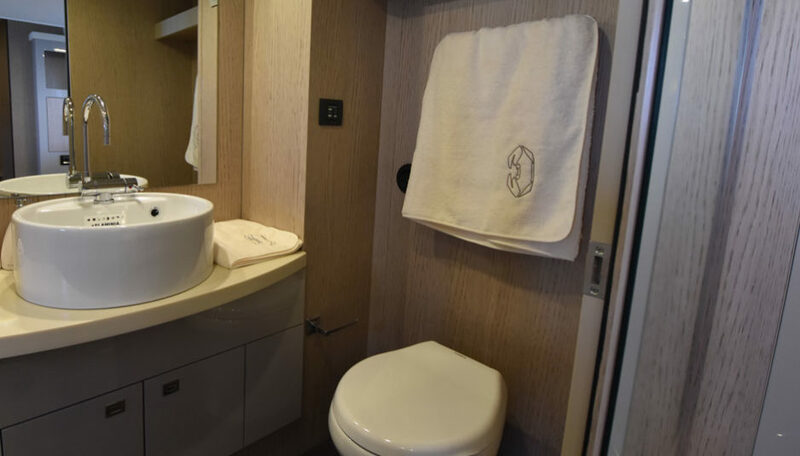 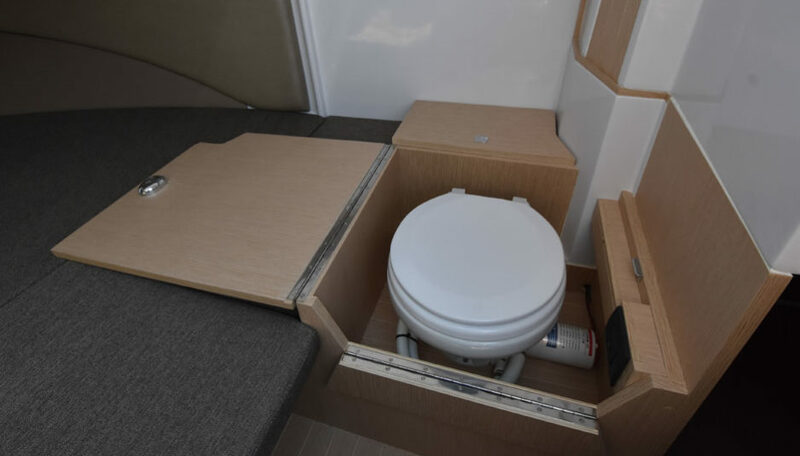 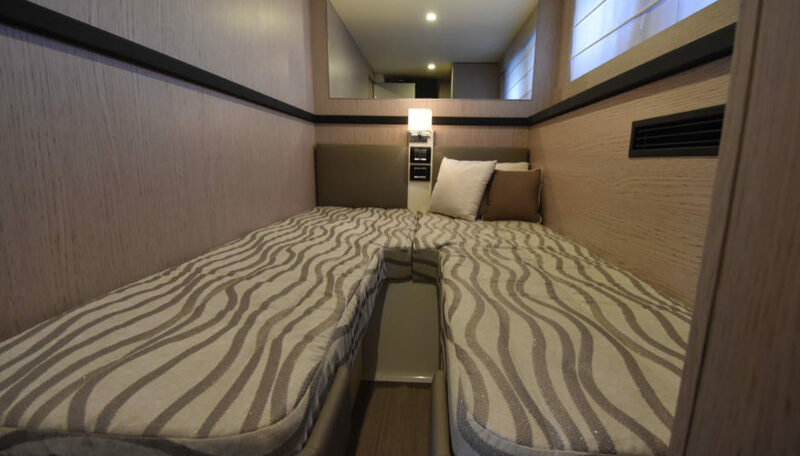 The VIP cabin is in the front and sports a classic central bed and a vanity corner to port. 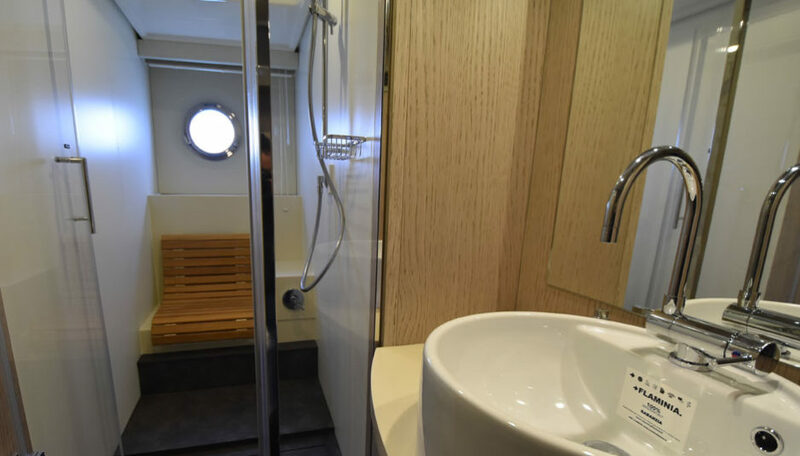 The second, large bathroom is shared with the guests in the third cabin, which features twin bunks. 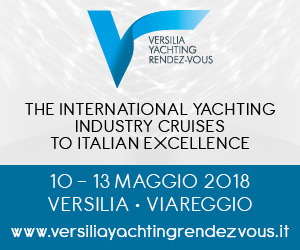 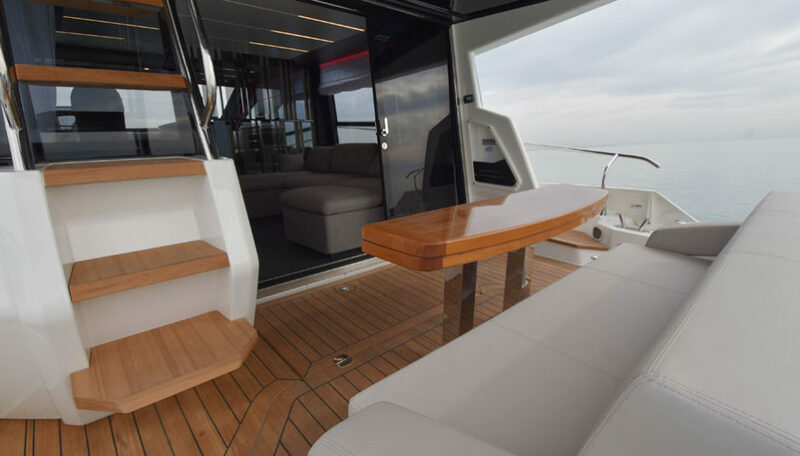 The aft area is developed according to traditional rules: a large table and chairs normally stay in the middle for the joy of guests sipping prosecco, and the latters can be stowed in dedicated lockers on the port side during navigation. 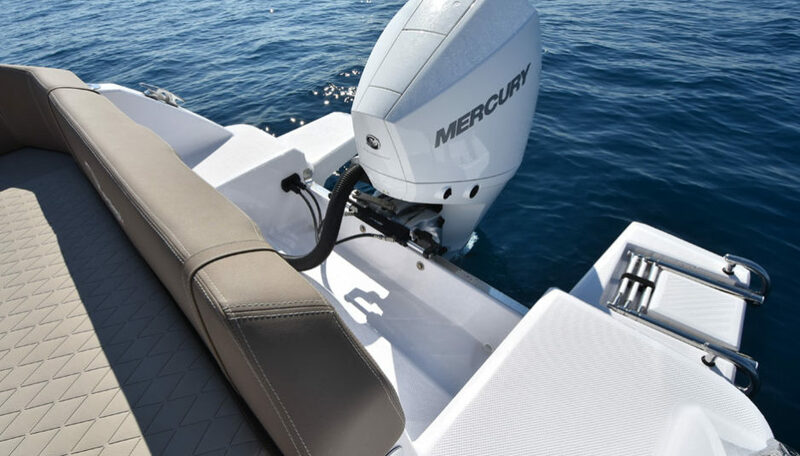 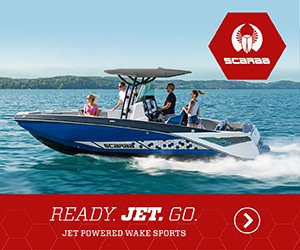 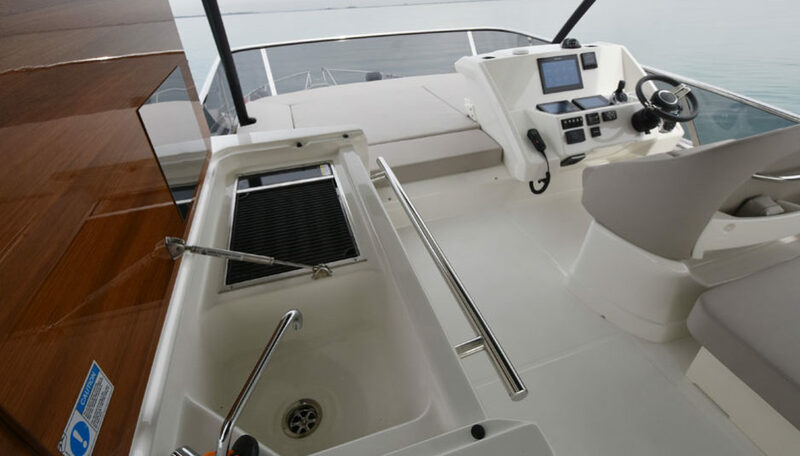 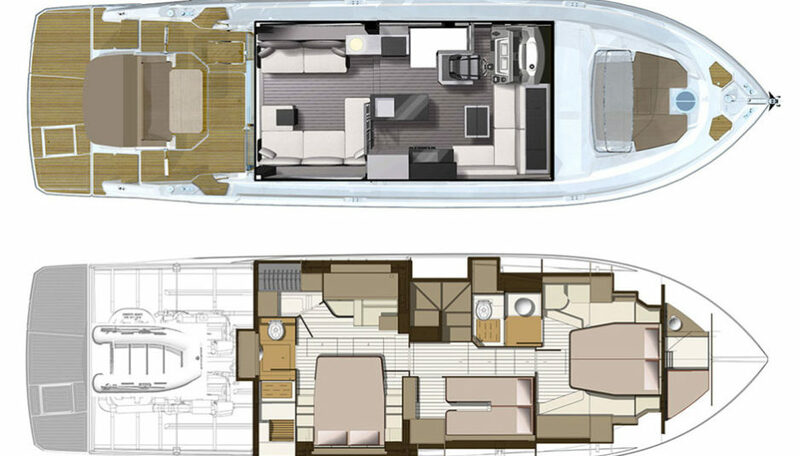 Wide passages lead to the swim platform which gives access to a large garage for a tender and additional gear. 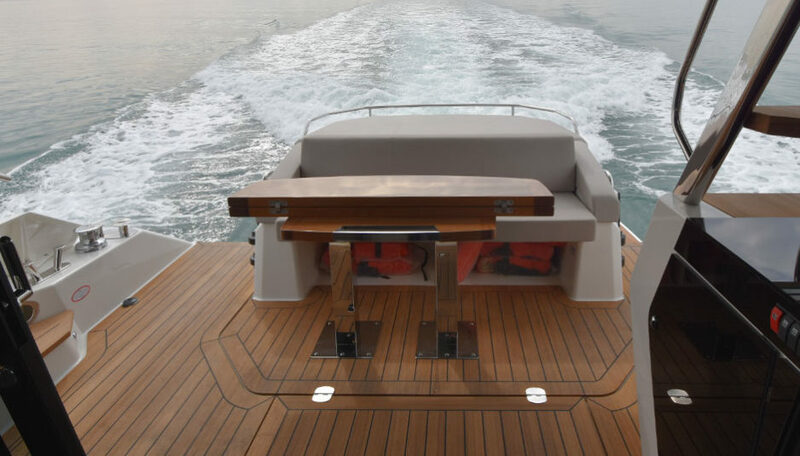 Two sidedecks, supported by safe handrails, bring to the fore area, where the crew cabin is located. 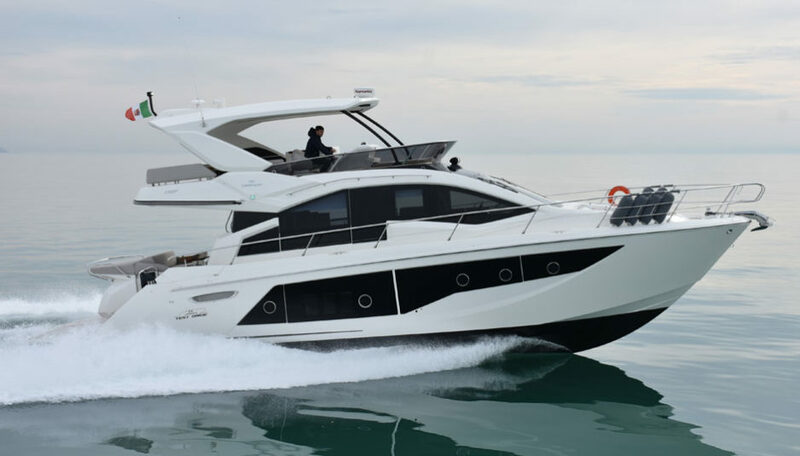 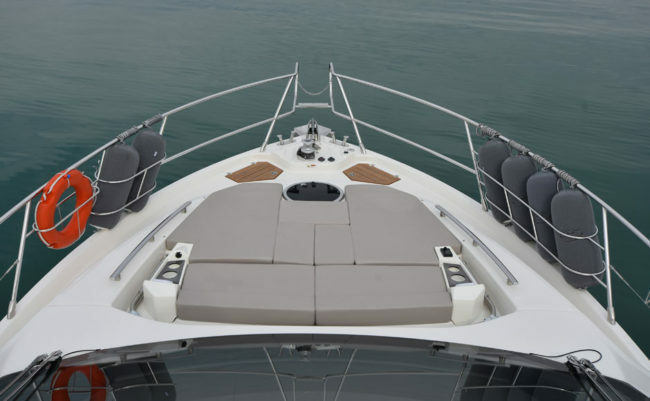 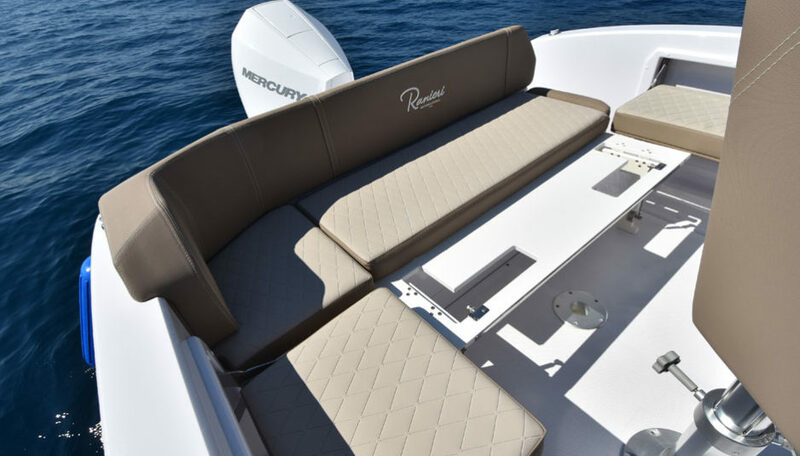 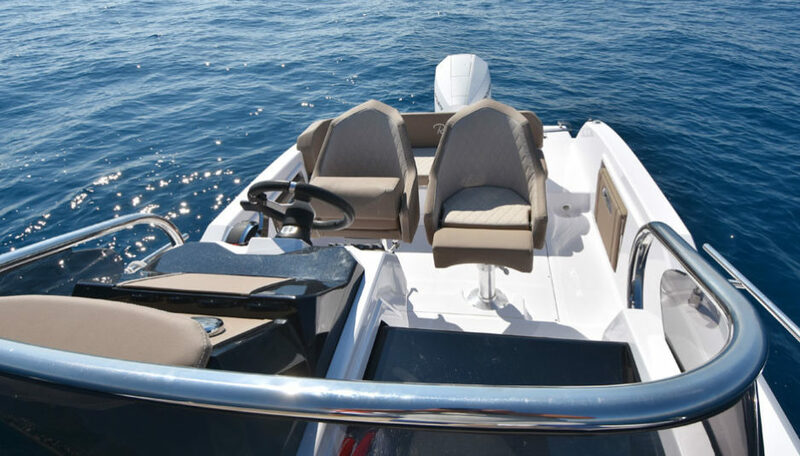 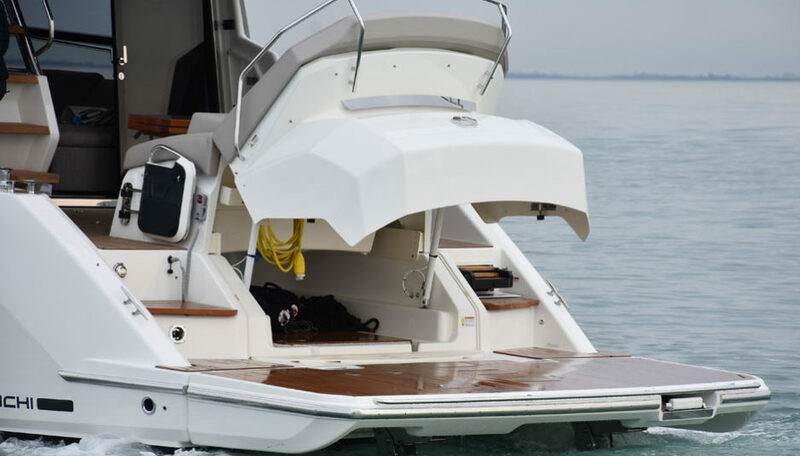 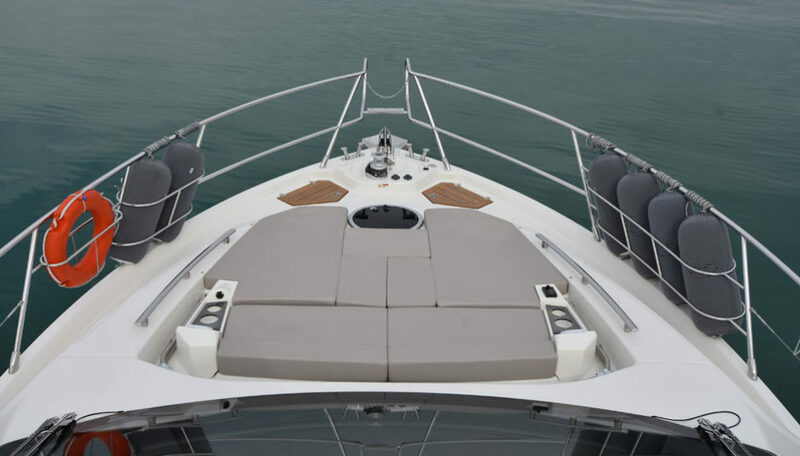 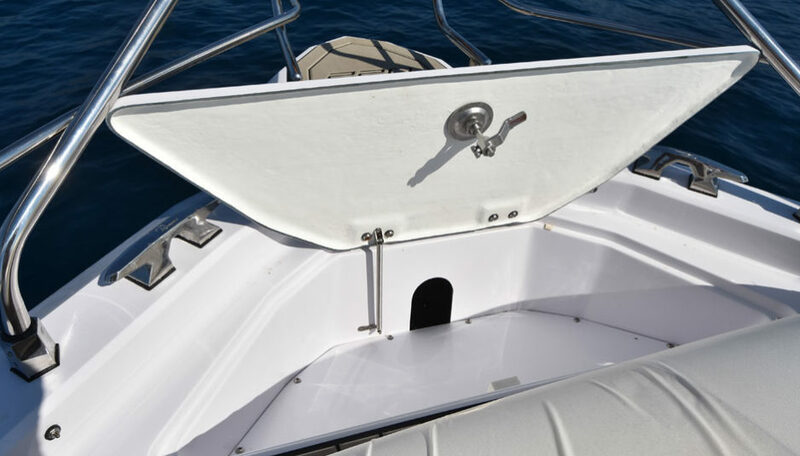 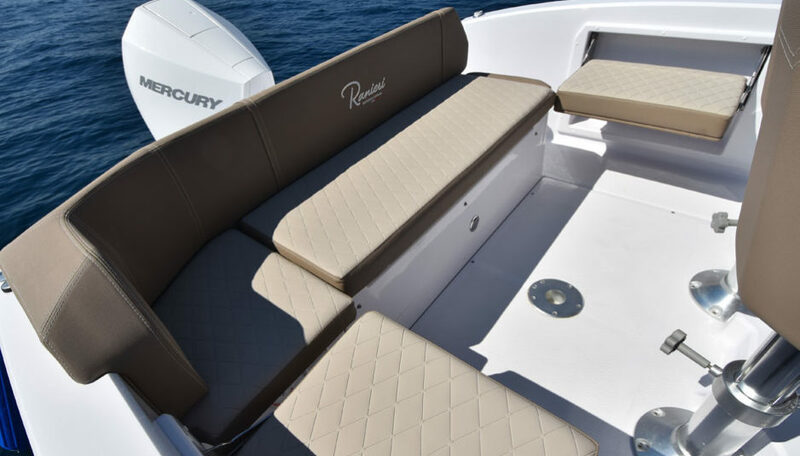 Of course when going to bow you’ll find a well-equipped sun bed with retractable awning, cup holders and hifi speakers. 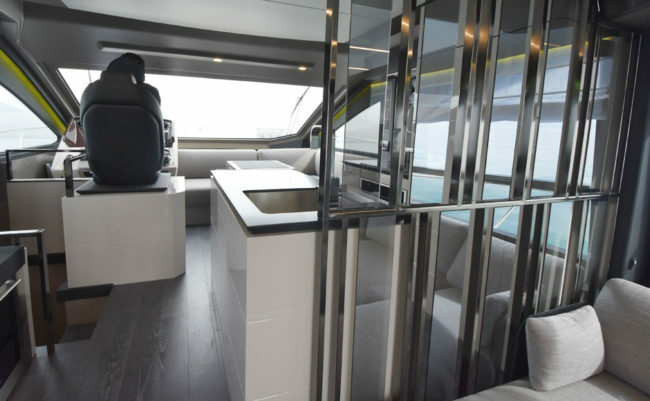 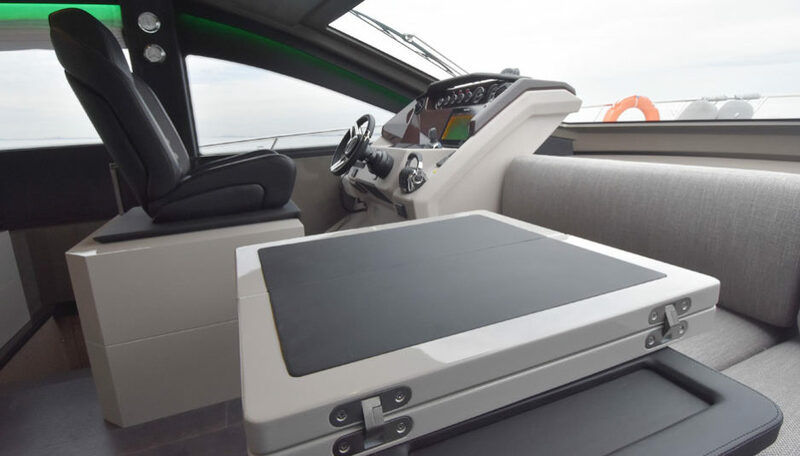 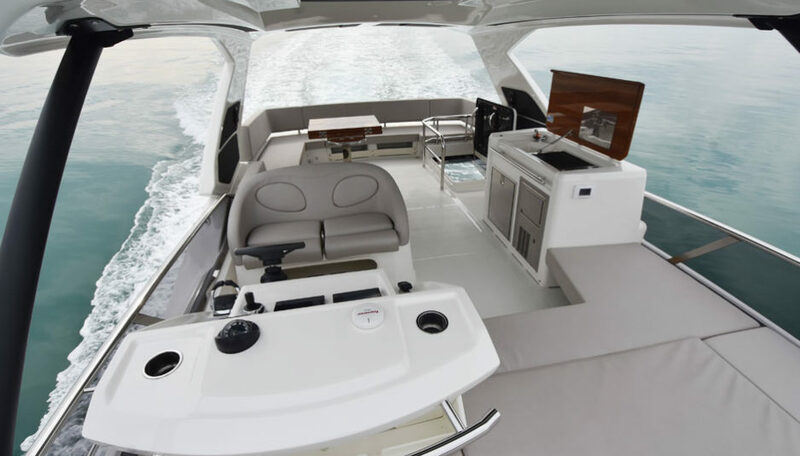 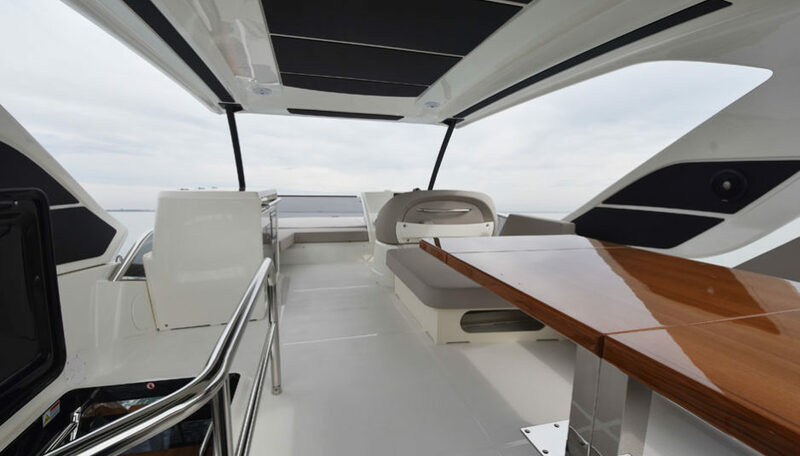 Last stage is the upper deck: a dinette at the stern boasts a grill cabinet as well, while in the front the second helm station is sided by another solarium. 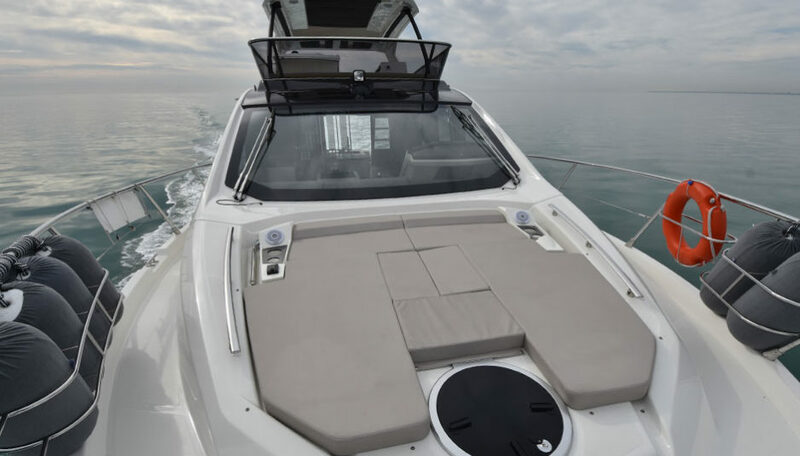 A massive hard top protects the spaces very well and doesn’t hinder the look of the yacht from outside (or…does it? 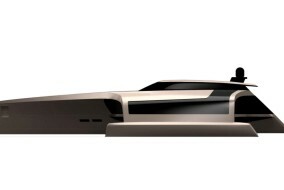 ), also supported by the nice design of the windows on the deckhouse and on the hull sides. 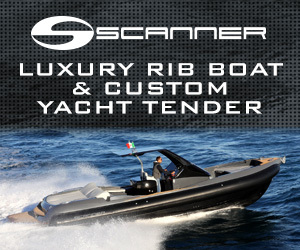 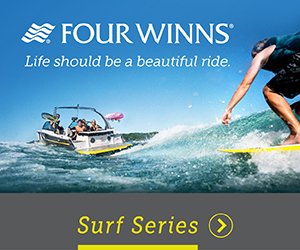 Go through the photo gallery on top of this page to see all the details we’ve been telling you.